The Fuzzbuzz family is a family of flying fuzzy insectoid creatures only found in Hey! Pikmin. So far, there is only one member in this family, the Spornet. All members of this family are in the Melissans genus. The Spornet is an enemy found in Hey! Pikmin. It is a small flying insectoid creature with a glowing abdomen. 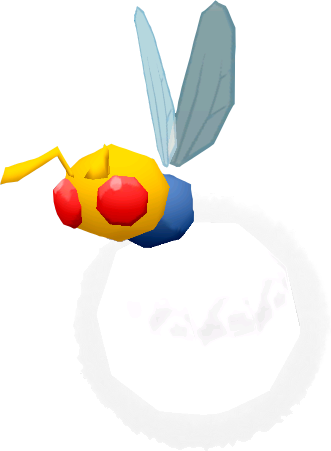 It attacks by hovering around and dropping toxic puffballs on Pikmin. They often fly very high, so Yellow Pikmin and Winged Pikmin are often provided in areas with it. Particularly: Describe and find out the family's Japanese name. The family's name comes from "fuzz", referring to members of the family and their fuzzy abdomens, while "buzz" likely comes from the appearence of members, which resemble bees. This page was last edited on April 16, 2019, at 19:02.